There is no shred of doubt that day by day the mobile apps are making everything more convenient and simplified. Just a simple click can get everything you want, delivered to you whenever you want it. The same is applicable in the case of flower delivery mobile apps as well. All you need to do is to select your favorite bouquet (well some apps also have options to customize your flower bouquet as well) then add some gifts and your loved ones will receive it on the right day at the right time. So, if you have a flower delivery business or you are a flower shop owner, then you must not miss this opportunity in the flower delivery business. It’s time for you to make chunks of revenue out of the flower delivery industry. Expand your franchise with a perfect flower delivery mobile app crafted with a blend of latest technology and innovative approach. How Are Florists Making Millions Of Dollars Through Mobile Apps? The whole world is going mobile, and the fact that businesses are improving their customer loyalty and sales with technology is undeniable. Virtual reality/Augmented reality, the Internet of things and mobile apps are remodeling the way we buy and sell items online. In the present scenario, flower delivery is a thriving M-commerce business. These mobile apps for florists deliver a unique aspect to the customers. For instance, customers can order the bouquet in advance, then send the flower bouquet to their loved ones. They can also add a personal note or gifts. Now as a customer if you want to gift a bouquet to someone or someone special then what would you prefer? To spend a lot of time visiting different flower shops to get the perfect flower bouquet or ordering a flower bouquet from a mobile app? The answer is pretty predictable; you will choose the way which will let you get the bouquet delivered to your loved ones without any hassle. So, if you are a florist or own a flower delivery business, then a flower delivery mobile app will reconstruct the way your customers interact with you. Furthermore, in 2015, the total sale of the U.S. flower industry generated 31.3 billion U.S. dollars, according to a report by Statista. And last year the entire global flower business made a whopping 60 billion U.S. dollars. If you don’t have a mobile app for your flower shop or flower delivery business, then you can search for App Developer Near Me query in Google. A mobile app is a significant profit element for your business, and if you lack one, then you should know that this is one of the prime reasons why your competitors are earning more than you. Your flower delivery application won’t be successful if you do not provide the essentials that are quality, quickness, and same day delivery. Quality and quickness are the two essential modules required for blossoming your flower business. Along with these two essentials, you should also provide same day delivery as everyone knows that flowers will wilt with time so it must be delivered the same day. Preferably, if you can deliver the flowers in an hour or two, then nothing can stop you from getting into the top shelves. In the present scenario, the word ‘on-demand solution’ means convenience. Whether your business model is B2B or B2C, you need to keep in mind that convenience is everything. So, keep in mind to provide convenient on-demand flower service to your customers. Since you are developing an on-demand flower delivery app which means you’ll have to deliver the flowers to various places like a home, office or corporate or anywhere and every customer will order flowers according to their environment so you must add a couple of handy features to your app to make it easy for all your customers. Your app must be equipped with easy to use, quick feature and must provide a seamless user interface to keep the user engaged as we all know an app with a bad user interface is really bad for business as it will just confuse and irritate the customers and they will go with your competitors instead. Integrating these features will make your app easy to use and will undoubtedly help you retain your existing customers. The last factor is to analyze the industry thoroughly. You will need to look at various things like the cost, how to maintain the quality, what should be the delivery period and so on. So, thorough market research will help in identifying the opportunities for your business. Your thorough market research will give you inputs like the customer satisfaction levels, nature of the competition you are going to face, modern technology in the market and the performance evaluation of your competitors. The research will also demand you to study the niche of your desired business. Dig through your competitor’s methods and learn how to solve a problem if it arises. As we all know deep and thorough market research is directly proportional to brand loyalty. So, the road to a successful flower delivery business with your flower delivery app can only be paved with keeping the above factors in mind. When you are ready to take your developed app into the market, you should understand the market. Above all, you should follow your competition and know how they are doing business. Let’s take a gander over the top flower delivery platforms. After comparison with other famous brands, it was found that the arrangements from this company were the ones that lasted beyond a week. FTD stands for Florists’ Transworld Delivery, and this company has been around for more than 100 years. After a customer places an order, then FTD hits a network of local florists and give the arrangement’s order to the flower shop that is nearest to the drop point or place of delivery. Amazon Prime members enjoy a lot of perks, and with their subscription, they can also send fresh flowers from a dozen brands to anyone without paying any shipping cost. The company is famous for its “fresh-from-the-field” flowers. Not only they offer gourmet and plants, but they also provide same day deliveries. Each arrangement offered by the Farmgirl Flowers’ is unique which means no two bouquets will ever look alike. Other than the company’s unique arrangements, they also deliver the flowers in its signature “upcycled” biodegradable coffee bags. The platform works with a vast number of florists in Los Angeles, New York City, and London to create and deliver unique arrangements. They also offer same day delivery. Either the users can log in with their email accounts, or they can use their social media accounts. After the users have signed up for the app, they can view the flowers, gourmet and bouquet arrangements that the flower shop offers. Users can also verify the price of the flowers and can get all the details about the products. With the help of filters, users can easily find what they are looking for in the app. They can apply the filter to sort out flower categories, for instance, they can select a particular flower, let’s say the user has selected rose then all the rose bouquets, different color of roses and all other product made of rose or that includes rose will be displayed along with its price and additional relevant information. Users will have to add their favorite flowers, gift combos and much more to the flower basket (cart). After that, the users can select the delivery time, destination and the occasion for delivering the flowers and arrangement. Users can select from the array of payment platforms such as PayPal, Net Banking, Credit/Debit Card, etc. to pay online. The users can’t go back in time to remember what they have ordered before, but they sure can go to their order history to check and repeat their previous orders. Users can track their orders within the app. The app will provide constant updates like your order is in the queue, your order is processed, your order is out for shipment and so on to keep the users informed. After the products are delivered, then the users can write reviews and give their valuable input regarding the quality, delivery, etc. in the form of feedback. The admin will log in to the app with the set of credentials provided to him/her by the developers. The admin can view all the order registered and process them according to his/her time frame. The admin has to verify all the deliveries which are to be made. After analyzing all the orders, the admin aligns them up to be delivered on the desired date. All the payments made by the users are monitored and managed by the admin. The admin is responsible for managing all the orders. He/she assigns all order requests to the drivers according to their schedule to meet the delivery deadlines in the right way. The admin assigns the order to each of the drivers and all relevant information like order details, delivery address and assigned vehicles are monitored, tracked and recorded by him/her. The admin is the only person who updates all the flower categories, gift combos, etc. on the app. The admin manages all the advertisements, email templates, banners and promotional campaigns running. 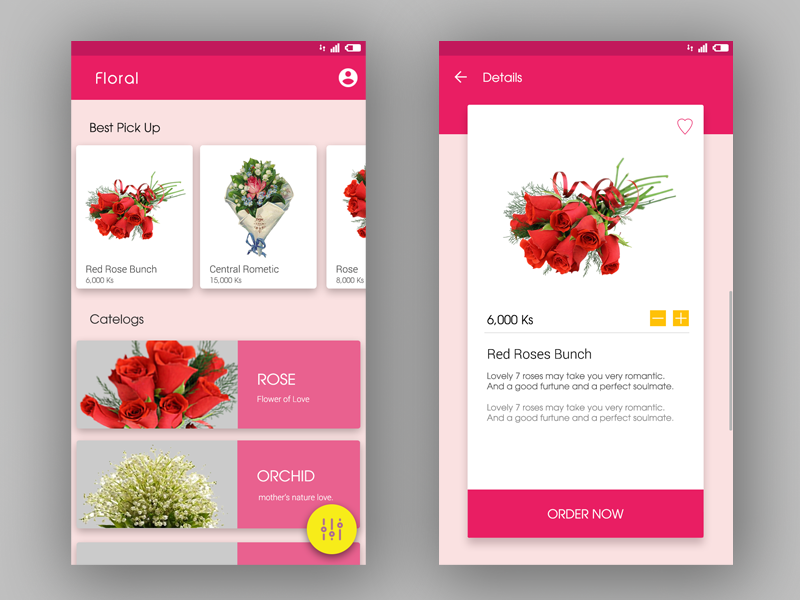 If you want to develop a successful flower delivery app, then this is one of the essential functions that you cannot afford to miss. This specific feature will allow the users to pick any particular flower from the variety of flowers and customize their own bunch of flowers. It means that the users can add a personal touch to the bouquet. An app with real-time analytics has various benefits. With the help of real-time analytics, the admin can check and view the live dashboard and all the pie charts & reports. The reports may include charts and graphs about the statistics of the orders received & processed, the favorite category of flowers, areas with maximum deliveries, user/customer acquisition & retention, most loved offers, etc. which can later help the admin to take appropriate actions and make important decisions regarding the business and the app. Push notification plays a significant role in keeping the users engaged with the app by keeping them updated about the customized/tailored offers, latest offers & deals, orders pending in the cart to be placed, the status of the placed orders and so on. Mass push notification: It informs all users about the most recent announcements and offers & deals. As the app owner, with the help of these notifications, you can share whatever messages you want to share with your old, new, active and inactive users. You can send coupon codes and other discounts to users. You can send notifications to the users about the orders that they have added to their cart and left it there only. You can send users notifications about the flowers which they were looking for earlier but couldn’t find or about the flowers that were out of stock. Cloud management helps in streamlining the functionality of the app and makes it fluent. 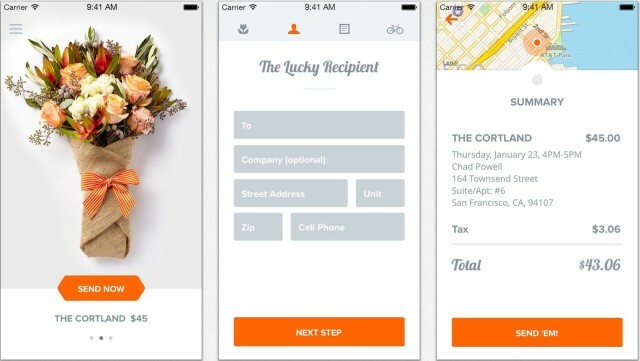 Cloud storage can be used to simplify and make the flower delivery app more convenient. You can store all the data like users’ information, gift combos, delivery data, driver’s information and so on, on the cloud. Payroll management is a crucial feature when it comes to making your flower delivery mobile app more sophisticated. This feature helps in monitoring, tracking and recording all the business partners and delivery boys. It also streamlines the operation and informs the admin even about the minute details he/she should know. Everyone loves a little customization, so it becomes crucial for your flower delivery app to have the option to customize their orders. With this feature, users can add more flowers, cards, gifts, teddy bears and so on to their arrangements. This feature not only keeps the users engaged with your app but also makes the arrangement budget-friendly for them. In today’s world, everyone likes to share everything on social platforms. So, when someone is making such an effort for them, then why should they fall behind. With social media integration, users can share what they have received with other people, which will again help in increasing the app’s visibility. You can display the most trending flower choices made by most of the users, or you can showcase the fresh arrivals of the season under this heading. The app may include varied delivery options, like same-day delivery, midnight delivery, instant delivery, etc. as required. This particular feature will help the user to add a personal note or letter to the arrangement. The users can also make it more attractive by adding pictures and graphics. Read also: Is Developing a Food Delivery Mobile Application a Good Idea? Flowers can be for any occasion, so, if you categorize them according to the occasion, then it will become a lot easier for the users to find the right bouquet for the right occasion. If your flower delivery app is serving many countries, then this feature is a necessity for your app. This feature will allow the user to send flowers to their loved one residing in another country and let them pay the amount in their own currency. All your app should be capable of is accepting different currencies to make it happen. Using an app may look easy, but a lot of hard work goes into the making of the app. If you want to develop an exceptional flower delivery mobile app, then you should be aware of the technology stack. For the Android platform, Java will be used, whereas, for the iOS platform, Swift would be the right choice. To safely store the data, cloud storage like Amazon Data Servers or the Google Cloud Storage should be used. Other than voice and text message verification, the app developers can use Google sign in or Facebook SDK to keep the spam bots away. The app developers can go for MongoDB, HBase, MySQL, Postgress, Cassandra, etc. to keep the data organized. It is extra imperative to find the right mobile app development company to develop the best flower delivery app. Along with the right mobile app development company, you need to find the right team for your app as well. So, let’s take a look at the team structure you will need for your app. The Project Manager must have years of experience and must be skilled enough to identify the best ways to develop the app with the team. Experienced iOS Developers, Android App Developer, Back End Developers, Expert UI/UX Designers and Graphic Designer. Skilled and Proficient QA experts will be required for delivering a fluid and user-friendly app to the users. Finally, What Is The Cost Of Developing The Flower Delivery Mobile App? The cost of developing the flower delivery app depends on many factors. Factors that holds a significant place are the attribute and features/ functions within the app. Along with these factors mentioned above, one factor that majorly affects the cost of development is the physical location of the mobile App Development Company and the app developers. The US/UK based developers charge around $70-$250 per hour, Eastern Europe based developers cost around $50 to $150 per hour, but the companies and developers in India provide the most reasonable rate which is $20-$70 per hour. Therefore, in India, it will cost around $6,000 to $20,000 for developing a flower delivery mobile application.